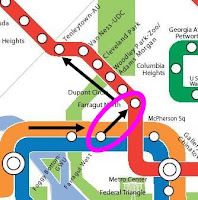 The Washington Post reported today that Richard Sarles has included in his first 6-month report as full-time Director of Metro, that the "Virtual Tunnel" between the Farragut stations will be functional this fall. I first promulgated this idea almost three years ago on the CommuterPage blog and have followed up numerous times since (More of the Invisible Tunnel, Testing the Invisible Tunnel, Now Even More Invisible?, Metro's response). Here's what the Post said today: "In his first six-month report since being hired as Metro’s permanent chief, Sarles also said the agency will create a 'virtual tunnel' between Farragut North on the Red Line and Farragut West on the Orange and Blue lines, allowing riders to go from one station to the other without paying a new fare." Why it took this long is a bit of a mystery. Metro has been tying this service to changes in the SmarTrip card, which are finally just now being completed. However, I learned way back in 2008 that the capability has always existed--even with paper farecards--to implement this service. It will be interesting to see how popular the tunnel is once the ridership is educated about it.